for $510,000 with 3 bedrooms and 2 full baths. This 2,050 square foot home was built in 1962 on a lot size of 163.19x385.76x174.36x190.84. VERY RARE OPPORTUNITY! Located less than 15 min. 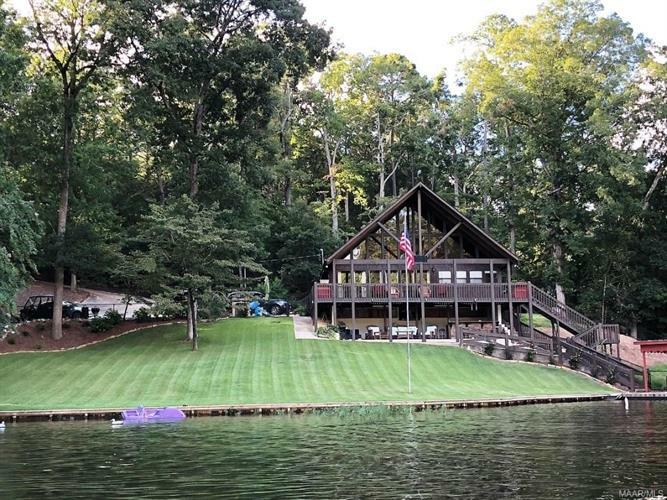 from I-65, & only a short drive to B'ham or Montgomery, this recently fully renovated & updated Lake Mitchell 'Bird Creek' waterfront home is Move in Ready! Perfectly situated on 1.2 acres, with 375 +/-Feet of Year Round Deep Waterfront, this fantastic home has TWO 'Grandfathered In' Fully Enclosed Boat Houses having a total of 4 Slips with lifts! In addition to the new bulkhead & boathouse posts installed in 2018, features include City water, Spray Foam Insulation, Security System with remote video monitoring, tiled hardwood look flooring, all new appliances including a gas range with underground gas storage, a large walk-in Pantry, Natural Stone Counter Tops, 2 gas Fireplaces, a large mud/laundry room, Covered A-Frame Porch on the Main Level, a large covered patio with a bar on the ground level, a wide concrete driveway & large parking area, a deep swimming area with little to no boat traffic, a large covered boat dock plus MUCH MORE!